After more than a decade of critique about the concept of neutrality in mediation, there is no consensus as to its relevance, meaning and application in practice. Although no longer a definitive element of practice, an understanding of neutrality remains an ethical requirement, according the National Mediation Accreditation Scheme. This article reviews the meanings attributed to neutrality and explores two recurrent themes: neutrality as impartiality; and as even-handedness. The author argues that common to these themes is the idea that neutrality is about the limitation (rather than exclusion) of bias, and proposes a review of the National Standards consistent with the reconstruction of neutrality discussed here. Reforms to family law have focused on changing the culture of how post-separation parenting arrangements are facilitated. In recognition of the fact that domestic violence is a significant factor in family breakdown, the reforms contained an exemption mechanism which can be implemented if there are safety concerns during family dispute resolution. However, the capacity of services to effectively screen and address the safety needs of clients in domestic violence situations is contested. This article presents an analysis of the intake and assessment forms of clients presenting at three family relationship centres (FRCs) in 2010. The findings from this research suggest that domestic violence is common for families presenting to FRCs but also that clients feel safe within the FDR process regardless of gender or presenting order. A major aspect of mediation involves listening to the disputants to enable the details of the dispute to be raised and clarified, and to assess suitable interventions to help disputants make decisions for the future. This author’s research on listening in conflict indicates that mediators use a highly developed capacity for inner listening to identify their own mental and emotional states in order to listen actively to disputants in conflict and to choose appropriate interventions. This is supported by theory from dialogue regarding the notion of suspension. Focusing on listening and inner awareness may heighten mediators’ self-awareness, empathy and capacity to support disputants’ self-determination. Increased self-awareness from inner listening or suspension may also assist mediators to achieve impartiality or situated neutrality. With the introduction of new commercial arbitration legislation in each State, Australian Attorneys-General have been spruiking that Australia is an “arbitration friendly” jurisdiction. The High Court in the Westport Insurance case has revealed its members have a dim view of arbitration decisions and the arbitration process. Should the Westport Insurance case be viewed as an example of the vices of arbitration or an example of the judiciary’s tendency not to respect the finality of arbitration awards? The growth of medium and high density residential living, and the trend towards master planned estates with additional lifestyle facilities, has led to an increase in developments that include shared assets. As part of these changes to urban form, more people in Victoria are living in multi-owned housing developments regulated by the Owners Corporation Act 2006 (Vic). 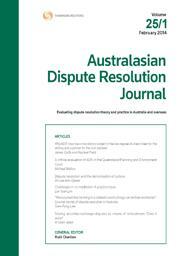 This article introduces a socio-legal study, which critically examines how owners corporation committee members are making use of the first tier of the dispute resolution model offered in this Act. The article presents qualitative data regarding the nature of disputes in owners corporations. It also describes an online information tool prepared by the project research team which provides dispute resolution knowledge and strategies for stakeholders. The New Zealand government and related agencies in the Treaty of Waitangi settlement process claim that the style of negotiation adopted in this process is interest based. It is also claimed by some organisations that the negotiation approach is in line with the Fisher and Ury interest-based model. These claims are inaccurate. The process does incorporate interest-based negotiation in some stages to a limited extent but in other stages the approach is absent. Even when the approach is incorporated it is not practised in accordance with the Fisher and Ury model. The negotiation style used can be more accurately defined as a hybrid. Statements relating to the nature of settlement negotiation should be revised to more accurately reflect what is actually occurring and consideration should be given to utilising a more comprehensive interest-based approach. The Yoga Sutras is a compilation of texts authored by Patanjali – some date from approximately over 2,000 years ago. One of its most famous parts delineates a moral code, known as the eight-limb path, which contains wisdom that usefully applies to modern principles of alternative dispute resolution (ADR). This article analyses the first five subcategories of the first “limb” of the Yoga Sutras. It applies concepts found throughout contemporary ADR to show that studying the Yoga Sutras could be a concise way to accomplish the goals asserted within contemporary ADR texts. By comparing the two, one can also see the usefulness and timelessness of the modern ADR principles. This article examines how the Chinese courts and arbitration commission have dealt with disputes containing multiple agreements, not all of which contain arbitration clauses. Issues explored include jurisdictional power, the question of double jeopardy, and 74 (2012) 23 ADRJ 73 extension of arbitration clauses. For the pdf version of the table of contents, click here: ADRJ Vol 23 Pt 2 contents. Click here to access this Part on Westlaw AU.